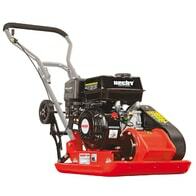 Petrol plate compactor with an engine of 163 ccm. Plate dimensions 530 x 370 mm. 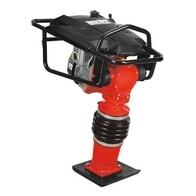 Compaction pressure 11000 N. Compaction depth 25 cm. Weight 63 kg. Folding wheels for easy transport. Damping pad included. Steel chassis. Petrol plate compactor with an engine of 196 ccm. Plate dimensions 540 x 420 mm. Compaction pressure 13000 N. Compaction depth 30 cm. Weight 83 kg. Folding wheels for easy transport. Damping pad included. Steel chassis. Petrol plate compactor with an engine of 196 ccm. Plate dimensions 580 x 500 mm. Compaction pressure 20000 N. Compaction depth 25 cm. Weight 92 kg. Folding wheels for easy transport. Damping pad included. Steel chassis. 4-stroke OHV petrol engine, displacement 149 ccm. Rammings shoe 35,5 x 28 cm. Centrifugal force 18.5 kN. Max. compaction depth 40 - 60 cm. Compact design, reinforced frame. Fuel tank capacity 2 litres. Weight 80 kg. Transport wheels included. Petrol powered vibration plate with 196 ccm engine. Dimensions of the vibration board 62 x 40 cm. Weight 117 kg. Centrifugal force 25 kN. Max. depth of compression 35 cm. Move forward - backward. Wheels and dumping pad included. Power wheel mini dumper. Transmission: 3 x forward 1 x reverse. 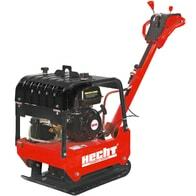 4 stroke engine HECHT OHV 196 ccm. Weight 160 kg (unladen). Load capacity 300 kg. Petrol transporter with power output of 9 HP - can load up to 500 kg.